Getting a good night's sleep without using addictive sleeping pills which have many side effects is something that many people would like to do. A good night's sleep can be hard to find, and it's no accident that, the sleeping pill market is close is $5 billion globally.Everybody needs about seven hours sleep every night but many struggle to get this. Sleeping pills can be both addictive and dangerous.So, even though some would say that a cure for sleeplessness is hard to find, here are some natural cures for insomnia or how to sleep all night without sleeping pills. There are two approaches to getting a full night’s sleep. The first is to remove the stressors that are keeping from one getting all the sleep one needs. The second is to repair the body’s sleep mechanisms. 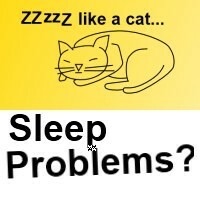 For instance, did you know that melatonin was necessary in order to get a good night’s sleep? Well, did you know that if you don’t get a good night’s sleep, the body doesn’t produce melatonin, so it’s a catch 22 situation. If you don’t sleep, your body doesn’t produce melatonin, and if you don’t produce melatonin, you don’t sleep. Taking a Melatonin supplement can, therefore, be a natural cure for insomnia. Did you know that both TV and computers affected the melatonin producing gland negatively? Research has shown that those people who watch television before bed, play computers games, or surf the net, produce less melatonin than those who don’t. Subsequently, their sleep is either short lived or interrupted. Eventually, sleep deprivation becomes a way of life, a catch 22 situation that perpetuates itself until one suffers from depression, gains weight, and has little energy left to do anything. So, one of the first things to go needs to be watching television or working on a computer anytime after five in the evening. Incidentally, computers are even worse for sleep than television. So simply not watching television is a contributing factor when it comes to a cure for insomnia. Obviously, if your pineal gland hasn’t produced a decent amount of melatonin, you need to supplement. However, before you rush to take melatonin, let me explain a little bit more about this substance. It can cause depression and sleeplessness. What it actually does is make the body prepare for darkness, and when the body prepares for darkness, it prepares to go to sleep. That’s why television and computers (which emit a lot of light) interfere with the sleep process. So, only take a very little about an hour before you go to bed. Generally, women should take about 100 micrograms and men about 150 micrograms. Don’t take more. In this case, less is more. You can read about melatonin in the link in the side bar. Remember that in your search for a cure for sleeplessness, you may need to combine many different factors, including behavior change and adding supplements or even exercise! The difficulty with saying that a glass of water with a quarter teaspoon of salt shortly before going to bed will make you sleep is that all that excess sodium chloride in your body mined from halite is going to interfere with this remedy. So, probably, this is going to take a little time. Firstly, switch from using table salt to using sea salt (and read the label) and then eliminate all processed foods from your diet (they contain an inordinate amount of ground up halite). Once that is accomplished, take that quarter teaspoon of sea salt in water about an hour before you go to bed. It aids sleep wonderfully! Remember to combine more than one cure for insomnia. That way, it will be easier to cure yourself from sleeplessness! You can read more about sea salt in the link in the side bar. You should always use sea salt. This means that the sea water is dried and the salt that remains is bottled. CELTIC SEA SALT IS ONE OF THE BEST. It seems that evolution also shaped our sleeping mechanism through our exposure to daylight. If one is in an office all day long, one doesn't sleep so well. Optimally, at some point during the day, you need to spend a couple of hours outside. Some can do with just a few minutes, but mostly people need to spend a few hours outside. If you're near the sea, a walk on the beach helps as well! Information about the importance of iodine in maintaining pineal gland and sleep health. An interesting article how iodine increases effectiveness of Pineal Gland. Aqueous solution. 94% distilled water. 4% Potassium Iodide. 2% Iodine. The Sun Makes You Sleepy! Have you ever noticed how after a day in the sun you sleep well? While currently it is thought that Vitamin D depletion might result in sleeplessness, because the body is a multi-faceted organism, it’s probably more than that. Spending a good hour or two in the sun every day makes sure that you sleep more easily and it considered a natural cure for insomnia. Is the sun bad for you? I’ve spent my life in the sun. I spent eight hours a day in the sun until I was thirty. I was so chocolate brown that some had difficulty believing my race! I still go out in the sun on a summer’s day. It makes me feel wonderful. No, I absolutely and utterly do not put those deadly screens on my body. There has been some evidence that some of the ingredients in them cause cancer. However, more than that, mankind has been living in the sun for millennia. Why on earth would the sun be bad for you? Of course, it’s not. What’s bad is the lack of nutrients in the human body caused by bad diet. This means that the body doesn’t have enough of the required substances used to protect against the sun. Yes, one does need some protection. I use raw coconut oil. So do people in the Philippines. They have beautiful skins and they are in the sun all day long. However, if you have a pale skin (this is genetic), you will need to experiment to find something that prevents burn without preventing the sun from producing vitamin D in your skin. It’s a good bet that the sun produces other things as well as Vitamin D. It just hasn’t been discovered yet. In any event, there is a correlation between sufficient Vitamin D and sleep. Get some more Vitamin D and you will find that this is another good natural cure for insomnia. Those people who live exceptionally long lives have a solid eight or nine hours sleep every night. Sleep restores the body by manufacturing vital chemicals that the body needs to maintain health. LEARN HOW TO RESTORE YOUR HEALTH HERE. FOUR WEEK FREE PROGRAM. In order for the body to return to a good night's sleep, it's necessary to restore health. This includes mental, emotional, and physical health. Of course, it's easier said than done, and one can cheat initially. Anything from consuming a half teaspoon of natural sea salt in a glass of water to spending an afternoon sitting in the sun will contribute to getting more sleep. As you get more sleep, you will begin - very gradually - to restore the body clock (the production of melatonin while you are sleeping). What you eat, what you drink, ditching the booze and the drugs, will all steadily contribute towards a healthy body. However, if you don't stop the stress or the long hours of work and play, lack of sleep will not go away. In the end, we are human beings with limitations to how well we will function if we don't work with who we really are. So, there you have it. If you add most of these changes to your current lifestyle, you should be able to get a good night’s sleep every night and wake up happy, rested, and with sufficient energy to get on with the rest of your day.